In case you didn’t hear, a car slammed into my house Sunday night. No one inside the house got hurt, but the drivers of the 2 cars involved were injured. Fortunately, there was no blood to clean up; only oil. I was mainly thinking about the damage to my house. What does that say about me? Well, as I say, no one was bleeding, externally at least. The man in the car that rammed into my house was standing in a painful daze, cradling his side. A few bystanders were attending to him. There was nothing I could do for the injured parties, but wait for the police, fire and ambulance to arrive. Once here, they methodically controlled the chaos. So #1, I learned, or rather was reminded, of the fact that I am self-centered. But enough about me. What else did I learn? 2. People make their livings doing all sorts of things that you never hear about unless a car careens into your house. And then you hear about them immediately. First, the T-shirt and jeans dude from Action Emergency Services’ girlfriend showed up, helpfully pointing out the impact impression left by the car to the dude, who then introduced himself and gave me his card. “Who is this girl pointing at my foundation?” I thought. It turns out that she is in some sort of relationship with a guy whose job it is to board up and secure damaged properties. Later, I would see two men shining in the brightest of polo shirts, standing shoulder to shoulder with T-shirt and jeans dude as if they were all in league together. These men, from the firm Seltzer and Goldstein, were public adjusters. “So you’re Seltzer and he’s Goldstein,” I quipped. I learned that I can be a joker. Public adjusters are state mandated to represent homeowners in the event of a claim on the Homeowner’s insurance. The Homeowner’s Insurance Company will send out its adjuster to appraise the damage and arrive at a payment amount. This adjuster represents the insurance company’s interests. A public adjuster to represents your (the homeowner’s) interests They fight on your behalf for the largest or most fair settlement possible, however you want to look at it. Public adjusters are paid a percentage of the final settlement. Later my wife and I would learn that although the driver of the vehicle that crashed into my house didn’t have a license, the owner of the car had insurance, meaning that we would not be battling our Homeowner’s Insurance Company for a check. So, no need for a public adjuster. Not so for people whose homes are in the path of a natural disaster. I learned that when a large one strikes, public adjusters from other states may be called in, and they may not know all the laws and regulations that pertain to insurance in the striken state, and as we all know, fine print is at the very heart of insurance. I also learned about freelance TV reporters. Just as I was thinking “Where is the Lynn Item?” I spied a guy with a TV camera weaving in the street, moving deftly for one carrying such a large object, asking if anyone would like to be on TV. “Was this for some reality show?” I wondered. “So you’re not affiliated with any news organization, but you show up at accident or crime scenes and record stories for the news?” I asked. 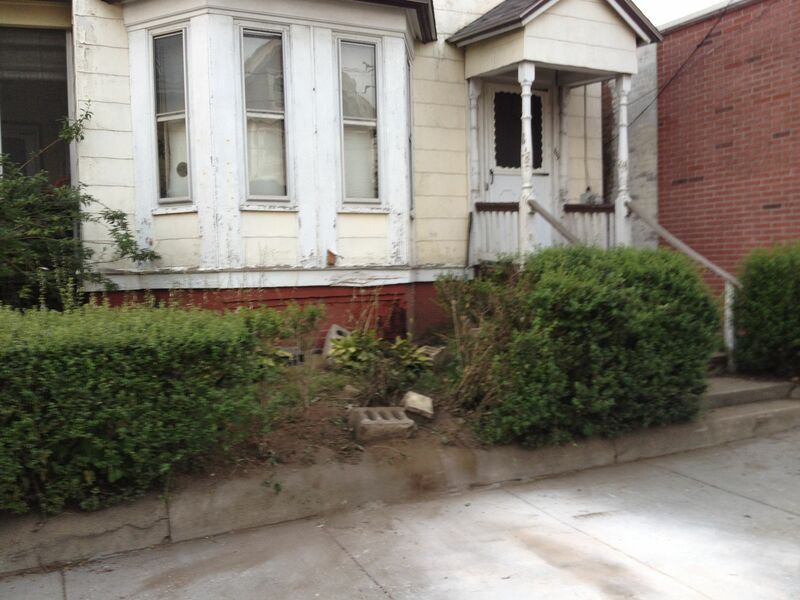 LYNN (FOX 25 / MyFoxBoston.com) – A car swerved off the road in Lynn, slamming into a house. It happened around 10:30 p.m. Sunday on Essex Street. Police say the driver somehow lost control of the car, drove through some bushes before hitting that house. And now, the rest of the story: According to all eyewitness accounts, the driver was drunk. He was coming down Essex toward Eastern at around 35-40 mph and slammed into the side of another car, before careening into my house. In true Roshomon fashion, there are two different accounts of how this actually transpired as both cars were going in the same direction. The driver of the second car was seriously injured. 4. This has all happened before and it will happen again. In fact the hedges in front of my house bore signs of a previous breech in the exact same place this car plowed through. It’s a busy street, and a mid-section of the hedge was less bushy and thinner than the rest. One of the first people we met in the neighborhood told us it was due to a car accident. A brand new Dodge Ram rammed into our house in December. Almost 3 months later and we’re still living in a travel trailer on our property and no work has been done on our house. The contractors that our home owners insurance go through have turned down the job and we are struggling to find another one.